KAMEN works with people of all adult ages, ethnic backgrounds, and genders at different stages in their career and across a variety of disciplines. Residents can apply for a period from 1 up to 3 months. KAMEN is a non-profit organization. KAMEN Artist Residency is a place that aims to cater to different types of artistic practices. We welcome artists, curators, and researchers across a wide range of fields. KAMEN is interested in exchange between people, ideas, methodologies, and disciplines, bridging diverse practices and interconnecting different forms of knowledge. We especially encourage cross-disciplinary projects;people working with performative practices, historical and sociopolitical research, mythology, anthro-pology, religious studies, geology, environmental issues, contemporary film, forms of writing, etc. As the residency building is surrounded by a large lakeside lot in a rather unexploited area, environmental projects are welcomed as well. By means of strategic introductions made throughout each residency session, KAMEN assists residents in engaging in intercultural collaborations with a diversity of local constituencies, as appropriate to each resident’s discipline and particular interests. KAMEN is also suitable as a peaceful place for retreat; to work on the production of art works, perform research, or write. Applications are open for all project phases: from the initial research to the finishing of works. KAMEN encourages an outcome to the time spent at the residency, but is not outcome-oriented. Each participant is invited to hold a public presentation, in any preferred format, scale, and environment at the end of their residency period. KAMEN facilitates exhibitions, presentations, and screenings to be held at a number of institutional, alternative, or public spaces in the area in collaboration with our partners. Residents can also hold a lecture, showing, master-class, or workshop for Academy of Fine Arts students in Trebinje. KAMEN has been partnering with different local cultural institutions and art associations, to assist in connecting its residents to local constituencies according to each project’s needs. 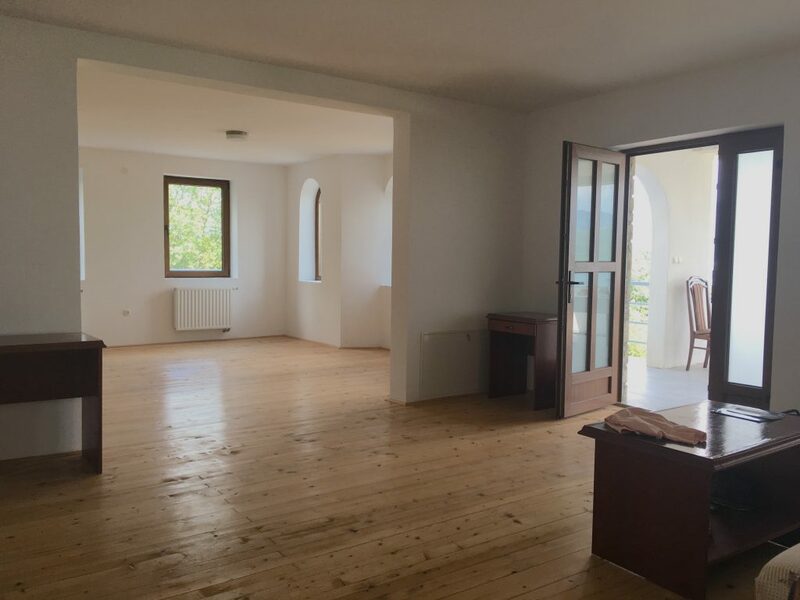 At this point we have several partners in Trebinje, the closest larger city 15 km from the residency, such as Gallery KC – Cultural Centre Trebinje, the Academy of Fine Arts, the Museum of Herzegovina, and its team of anthro-pologists, ethnologists, and archeologists. We also collaborate with several smaller associations that practice traditional craft (weaving, crochet, embroidery, icon-painting), singing, dancing and manufacturing musical instruments, as well as the local mountaineering society and elementary and high schools. 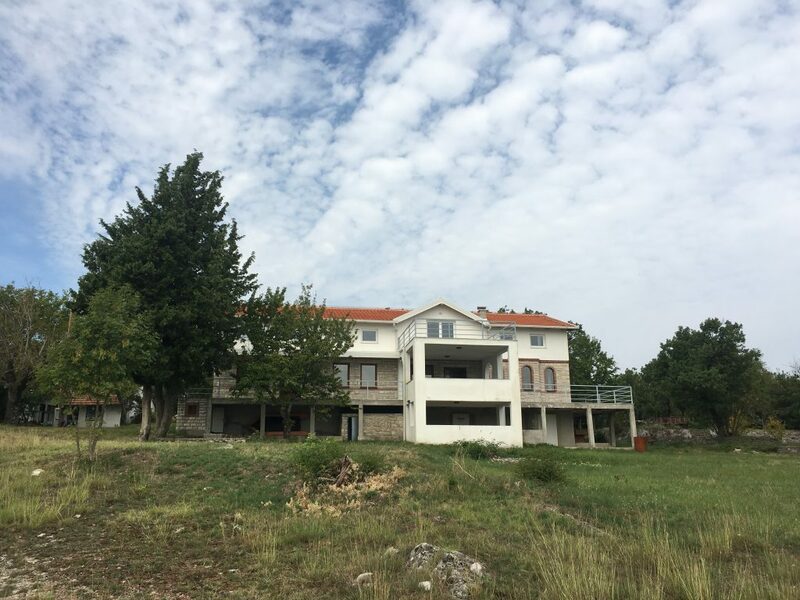 KAMEN is located in a quiet rural area on the outskirts of Orah, a village that is home to just a few families, close to the Bilećko Lake in Bosnia-Herzegovina. The residency neighbors a 14thcentury Orthodox monastery, where nuns practicepainting icons. 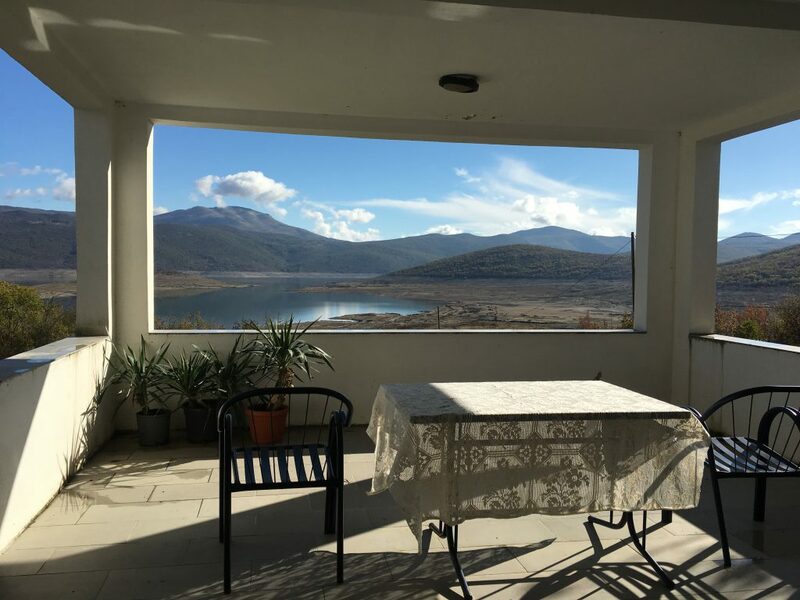 The residency overlooks the Bilećko lake, which was artificially formed in 1968. When the lake was constructed, five villages flooded, including its houses, graveyards, and also the remains of a Roman villa with spectacular floor mosaics. 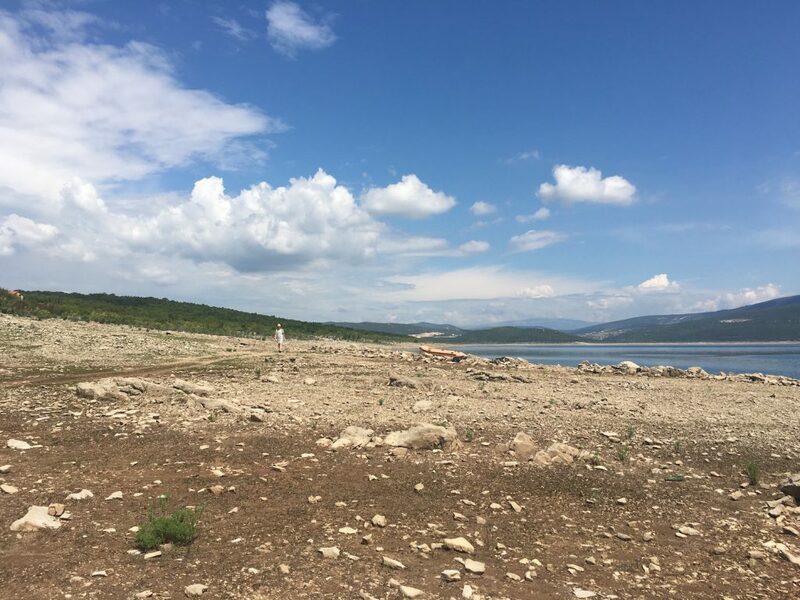 In the summertime when the water level lowers, it is possible to walk on the bottom of the lake, through the remains of the flooded villages and ruins. Two small islands in the lake, right in front of the residency building, then become hills that can be reached on foot. The seasonal changes and the plentiful cultural responses to the seasons makes Orah an exciting and inspiring area, to which we aim to connect in our day-to-day life at the residency. KAMEN is focused on creating self-sustainable circumstances. Aside from our own fruit orchard and vegetable garden in development, nearly all food products are organic and bought locally. Fresh fish comes from the lake, wine and honey from the monastery, the cheese from the neighbors and so on. We are also planning to start beekeeping and to develop our garden further to eventually be able to produce more of our own provisions. KAMEN works with a non-refundable residency fee to be paid in advance. 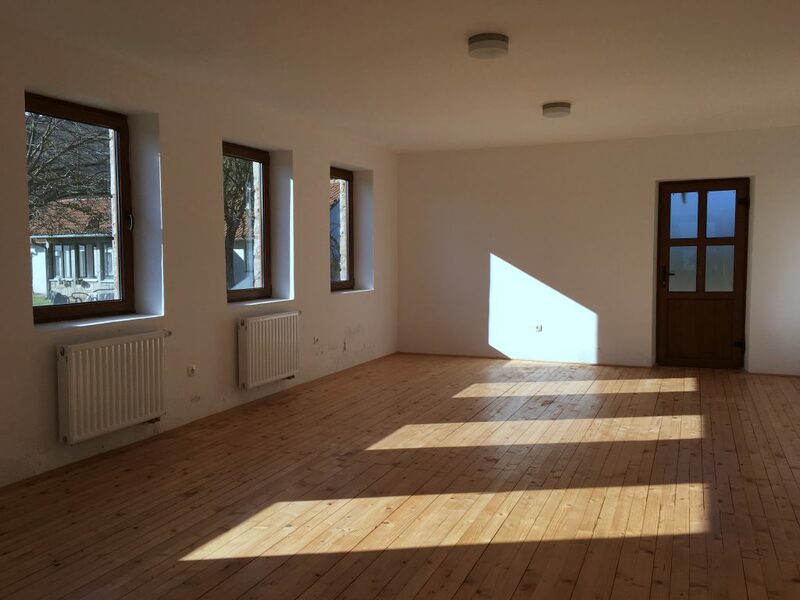 It covers accommodation, studio space(s) and facilities. Food is included in the application fee. Due to the small size of the group, we practice collective cooking and can consider specific dietary restrictions or wishes. Beside the residency fee, the resident must cover expenses for travel, local transport, and additional specific working materials. We encourage residents to apply for external grants. An official letter of invitation can be provided by KAMEN if required for (travel) grants or visa applications. Excursions to places of interest in the surroundings, including museums, galleries etc. The residency building is newly built, surrounded by a large outdoor terrace and a private lot of land, reaching out to the lake: a total of approximately 600 square meters of living and working space. Our accommodation provides space for up to four artists at the time, with each a private room of about 28m2, private and shared working spaces, and communal areas such as a kitchen, living room, dining room, and outdoor areas. Artists-couples are accepted. Pet-friendly. There is also a smaller guest room, intended for guests-professionals collaborating with residents; for a maximum stay of 2 nights. Video projector (1x), media player (3x) and 21” LCD screen (3x). The selection committee of KAMEN, an interdisciplinary group of individuals who share a strong commitment to the arts, creative, and critical thinking, review submitted proposals. The committee chooses projects based on the quality of work, commitment to practice and ability to interact positively with a community at large. Each resident period will host a group of people working in a variety of disciplines. Koštana Banović (1960, Sarajevo) is a multidisciplinary artist and filmmaker; she works in various disciplines and media such as drawing, performance, video and film. Her research addresses the interaction between experimental and cinéma vérité documentary style, mostly categorized as essay film genre. Her films are multiply awarded and screened at many film festivals around the world, like IFFRotterdam. Koštana was a tutor at the Faculty of Fine Arts and Design of the University of Arts in Utrecht (HKU) in the Netherlands, department digital media (2007-17), and guest teacher at various graduate and postgraduate art institutes and schools, like Dutch Art Institute in Arnhem and Jan van Eyck Academy in Maastricht. Her work is in collections amongst other of Stedelijk Museum Amsterdam and Van Abbemuseum in Eindhoven, in the Netherlands. Marianne Theunissen (1960, Linne) is a multidisciplinary artist; she is a writer and she makes films, performances and sculptures. The last 3 years she did a Master Research at the University of Utrecht on the agency and autonomy of objects in the field of visual arts. She won the Dutch Royal price for painting twice and received many grants from the Mondriaan Fund. From 2005 till 2017 she was curator of the M4gastatelier, an artist in residence in Amsterdam, for which she organized many exhibitions and art-events, around themes like ‘notations’, ‘type and characters’, and ‘the performativity of things’. She is a tutor of the Gerrit Rietveld Academy, department of fine arts and she is a guest teacher at the academies of Utrecht, The Hague, Enschede, at the Design Academy in Eindhoven, the academy of fine arts in Gent (Belgium) and Vilnius (Lithuania). Temra Pavlovic (1990, Utrecht; BFA 2012, Film/Video, CalArts) is an artist living in Amsterdam. Her videos and sculptures examine our relationship to sense-making and the way images come to exercise thinking. Recent solo exhibitions include ‘T2018 je t’aime’ at Kantine in Brussels and ‘Prefixes 4 and 2: the way you customize your uniform’ at Lodos gallery in Mexico City. She is a member of collaborative Oa4s (On all fours, together with Michael Ray-Von), with which recent exhibitions include ‘Friendship’ at KevinSpace in Vienna, and ‘Spirit butterfly X’ at Lodos gallery in Mexico. Honors include the Princess Grace Award for undergraduate filmmaking in 2011; a young talent stipend from the Mondriaan Fund in 2015 and a Transmediale Non-Fiction contribution from the Stimuleringsfonds in 2017 for a film currently in production. Marleen de Witte (1974, Delft, NL) holds a PhD in cultural anthropology and is assistant professor of Cultural Anthropology at the University of Amsterdam. Her research interests include religion and media, the senses and the body, cultural heritage, popular culture, funeral rituals, globalization, urban Africa (ip. Ghana) and the African diaspora (ip. Afro-Europe). Marleen approaches her topics in an interdisciplinary manner, bringing the social sciences in conversation with the humanities, including philosophy, religious studies, media studies, and art and art history. In 2012 Marleen received the Keetje Hodshon Award (in philosophy and religion) and her ongoing project ‘African by Design: self-styling among Afro-Dutch youth in Amsterdam’, is awarded a Veni grant from the Netherlands Organization for Scientific Research NWO.